Hey, everybody. I know I've been absent from the forums a lot lately and my reviews have been increasingly infrequent. I just wanted to pop in for a few minutes and say, 1) there's a reason for that, and 2) I will be returning to more regular chatting/reviewing very soon. But as for the most important thing right now, I have a short announcement. A week ago today (the same day Super Mario Maker released, coincidentally), I finally became a father! So before I go and try to get a few hours of sleep before starting on a new review for you fine forumites tomorrow, I thought I could leave you with a bit of cuteness. While you woefully wait woefully for my wondrous return to the wacky world of WiiWareWave, please give a warm welcome to the newest member of the WWW extended family, my dragony daughter, Wilda Ororo Muzio. Aww she's adorable! Congratulations, my friend. 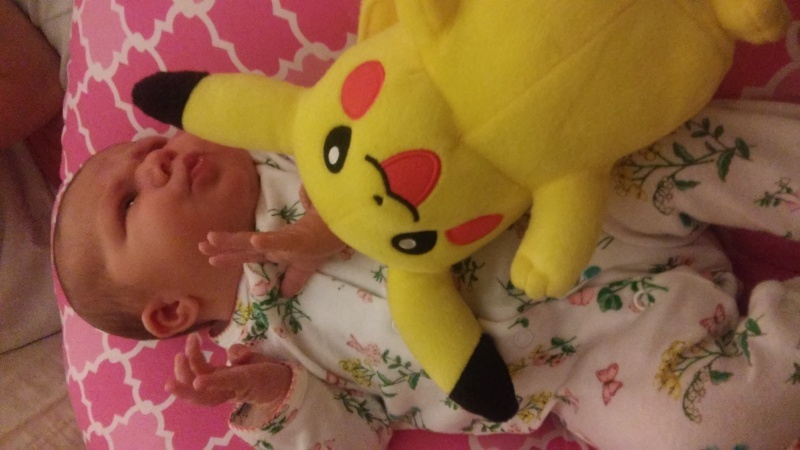 She looks so cute cuddling with that Pikachu! Ichigofan wrote: Aww she's adorable! Congratulations, my friend. @Ichigofan You took the words from my mouth! @bro2dragons Congratulations on your little wyrmling! Is your baby enjoying the holidays? How's daddy life been treating you @bro2dragons?